Waist Pack is Made Up of Waterproof Lycra Fabric, Flex Buckles and Elastic Belt, The Main Pocket Size(7.8×3.9inch)Fits Almost of Smartphones(iPhone 7 7PLUS 6S PLUS,6S,6 PLUS,6,5S,5C,5,SE.Samsung Galaxy S7,S6,S5,S4,S3.Note 5,4,3,2. Note Edge. LG G5,G4,G3,G3,Stylus 2/PLUS.HTC M9,M8,M7)and Easy to Damage or Wet Ttems（Ring, Cards, Cash, IC, Earphone, Tissue, MP3-Player,Car Key,Chewing Gum, Small Security Emergency Supplies). Ear Maicon is Included in the Main Bag, Plastic Zipper and Soft fabric, Protect You From the Noise and Enjoy High Quality Music Life! 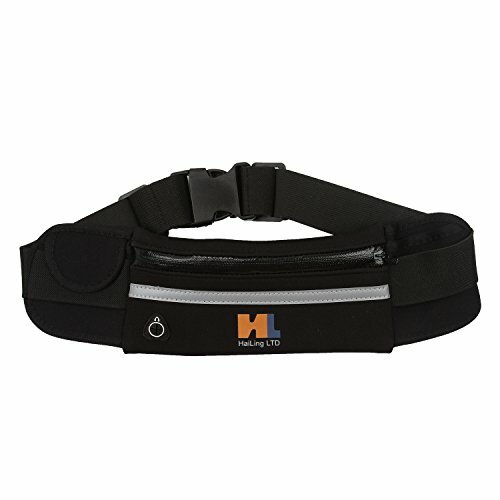 Combined With The Extended Bland, High-Quality Elastic Expandable Strap for Perfect Fits Your Waist Size and Crossbody Bag Length, Running Belt is Adjustable and Can Fit Extra Sizes 25″ Up To 49″ in No Stretch Condition. Can Be Used as a Purse, Crossbody Bag,Inclined Shoulder Bag or Expansion Pack. It is the Ideal Leisure, Sports, Shopping, Fitness or Slimming and the Necessities(Hiking, Beach, Cycling, Running, Concerts, Walking Your Dog or Pet and More)for Outdoor Activities, Close – Fitting Waterproof Protection, Without Having to Worry About Security, Rest Assured to Do Things, Liberation of Your Hands. If Your Phone Thickness is Extraordinary, May Be Can Not Fit Your Phone. Also Do Not Exposure to a Lot of Water or Rain for Long Time, Wash in the Washing Machine is Inappropriate as High Temperature, Detergent, And Centrifuging May Damage the Waterproof Material. So Suggest That Hand Washing is More Reliable. Running Waist Packs Warranty Applies Only to Purchases Made From HAI LING Original Manufacturer’s and Sales, No Other Authorized Sellers. Deliver Goods Only FBA.